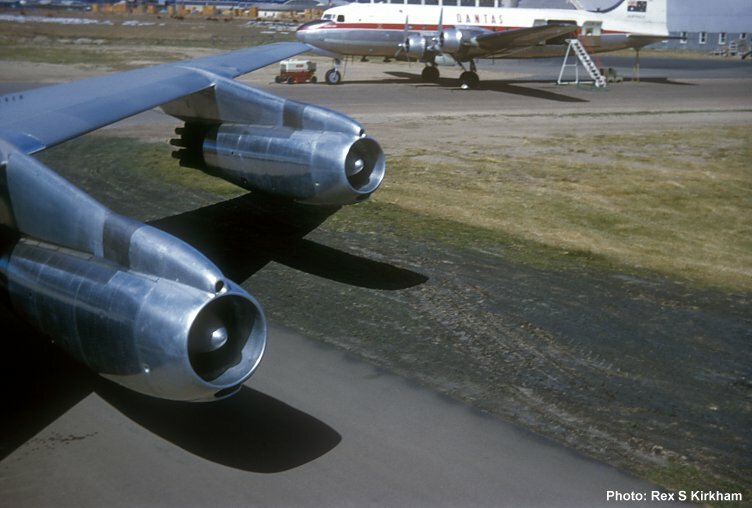 Boeing 707-138 VH-EBB City of Sydney undergoing an engine change at Brisbane, Eagle Farm on 17 August 1959. The Qantas DC-4 VH-EBM Philippine Trader, shown in the background, departed Sydney at 0545 on 17 August with a replacement engine. The DC-4 returned to Sydney later that day with the defective engine. Two months later, VH-EBM was retired from the Qantas fleet. This view was taken from the top of the stairs at VH-EBB looking east towards the Ford plant.